Most business owners don’t view invoicing or billing as an expense. It’s a necessary task if you want to grow into a thriving and successful business. But, billing is an expense. And it can be a pricey one at that. Between hiring employees to create, process, and manage bills to purchasing paper, stamps, and software, these expenses can quickly cut into your profits. Thankfully, online payments has made this process cheaper and faster, specifically with recurring billing. Recurring billing is simply a convenient way to automatically bill your customers each month for the same amount of money. During each billing cycle the customer receives a notification electronically, which also triggers an automatic payment via credit card, ACH, or wire. Besides the convenience, here are the other advantages of recurring billing. Perfect for a wide-range of businesses. A subscription box where customers receive a box full of goodies, such as Birchbox and Pop Sugar’s Must Have Box. A maintenance plan, think of heating and air conditioned specialists or landscapers, which includes scheduled appointments. Auto-delivered products like Dollar Shave Club. Providing educational content or training materials to your customers each month. Appointment opportunities for businesses like hair salons or medical professionals. Membership clubs, which is basically a monthly fee to gain membership in a “club” that earns freebies or discounts. Utility companies who charge you for service each month. Because recurring billing is consistent like clockwork, and guarantees that you’ll get paid, calculating your income is incredibly easy since you know exactly what you’re going to receive during a specific timeframe. You can use this information to forecast future growth and earnings as well. In short, recurring billing improves your cash flow and assists you in long-term financial planning. Decreases late or missed payments. 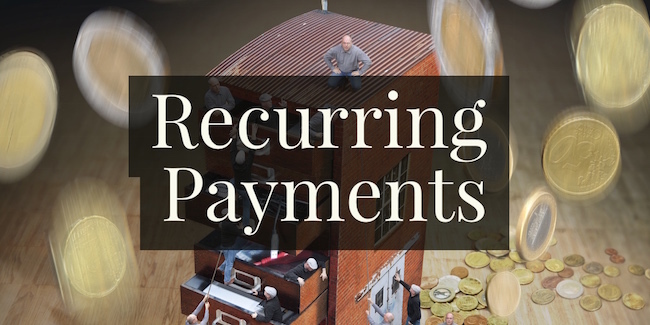 For both customers and merchants, recurring billing can decrease late payments. For merchants, that’s not only good for your cash flow, it also saves you time and money from having to chase down those late payments or remembering to send out a bill, which means that you can focus on tasks that can grow or improve your business. For customers, they no longer have to remember due dates or worry about expensive late fees because of a late payment. Another perk of recurring billing is that you don’t have to have those awkward late-payment conversations with clients or customers, which can go a long-way in building your relationship with your customers. Personally, as a consumer, I always set-up automatic payments if available. This gives me control when the payments are withdrawn from my account, and I can basically eliminate the need for envelopes and stamps. It also gives me peace of mind since I don’t have to worry about ever forgetting to make-a-payment and then getting hit with a late fee. Think of all the manpower your spend generating invoices each week. How about the costs of mailing and processing payments as well? Those costs all add-up. If you were to automatically process eChecks, for example, you can cut your processing costs by 60%. Automated payments replace all of those sheets of paper and manual bookkeeping tasks. With automation you can send out bills, receive a payment, and record the payments without having to lift a finger. With recurring billing you can securely manage your customer’s information, as well as reducing the duplication and circulation of sensitive information and preventing other types of employee error. You first need to find a solution that offers a recurring payment option, such as Due. After selecting your solution, inform your customers or clients that you have this option and guide them along in setting up recurring payments. Make sure that you set; Schedule start date; Billing frequency; Scheduled End Date; First payment amount; and Subsequent payment amounts. Finally, make sure that you follow PCI compliance. For example, you can’t store credit card information, so you may want to consider using eChecks or a tokenization system.